So how do you balance taking preventive care of your project with starting on time? By controlling the order in which you plan. That’s why we’ve created this pre-project checklist. By taking a top-down approach, you can start planning the broadest, most important elements of a project first, and make smaller tasks more flexible. Each item builds on what comes before it, eventually creating a project plan with high- and low-level goals. The first three sections are the essential building blocks, and the latter, narrower sections are the more granular tactics. With this checklist, you can quickly map out a project, and get headed in the right direction while still creating opportunities to learn on the fly, as a team. Establishing the big picture—the “what,” “who,” and “when” of a project—creates a structure to hang day-to-day details on. Creating a comprehensive scope, a well-balanced and highly skilled team, and a realistic timeline are the most important steps to building a successful project. These three points will be your project’s North Star going forward. What problem is the project going to solve? The answer will become the project’s main objective. By framing a project in terms of problem-solving, you’re also clarifying the meaning of the project for your team (the “what” + the “why”). Projects are not random mandates from above; they serve a specific purpose for the company. A sufficient explanation of that purpose can help employees understand its importance and motivate them to accomplish tasks. After the goal is established, write down in broad terms what work needs to be done to achieve the goal, and divide the work into categories. For instance, if you’re building a new website, you’ll have input from engineering, marketing, and design. When you think about how to get the work done, consider the limited resources available at your company. Time, money, and people are in limited supply. That affects a project’s final deadline, reduces the number of tools, and restricts the number of people you can recruit to do the work. Understanding these limits helps you know how to achieve a project’s specific goals. Finally, you can create tasks and to-do lists. These are the bite-size chunks of work that can be assigned to individual team members. With limits in mind, consider how realistic work assignments are. If engineers are stretched thin at your company, you might not want to create engineering tasks that will consume entire days or weeks. If the design team has members in different time zones, don’t create dependent tasks that hold some members back. The initial task lists are subject to change, so don’t let the details of each task slow you down. As long as you understand the structure and basic ideas, you can move on to the next aspect of planning. Now that you have a sense of the project’s scope and the tasks that must be completed to achieve your goals, you can start to assemble a team. The team should not be your favorite colleagues or even those who are “best” at their jobs, but rather the best people for the objectives and tasks you’ve laid out in the scope. For this reason, it may be helpful to come up with project-specific roles and responsibilities. You can even come up with titles related to seniority and expertise. For example, a team member from Customer Success may be called on to approve new software features; he or she can be the Customer Advocate. An engineer may be tasked with checking code for errors, thus serving as the QA Analyst. If you fail to find the right balance of domain-area experts and efficient executors, you might fall into the trap of micromanaging, when you could instead establish a hierarchy that gives everyone more autonomy. The project manager is also responsible for delegation of the workload and has to consider this when assembling the team. First-choice recruits may not be available or may have lots going on leading up to the deadline. In order for your team to create meaningful work, each member needs to be able to focus and contribute without having to juggle too much. Not only that, but team members should also have demonstrated interest in the project’s topic. This will help create a positive atmosphere that motivates workers. Once you’ve found the most talented, enthusiastic, and available colleagues, you can start thinking about the pacing needed to meet goals and deadlines. Once everything is in place, you can start to create a timeline that your team can follow. 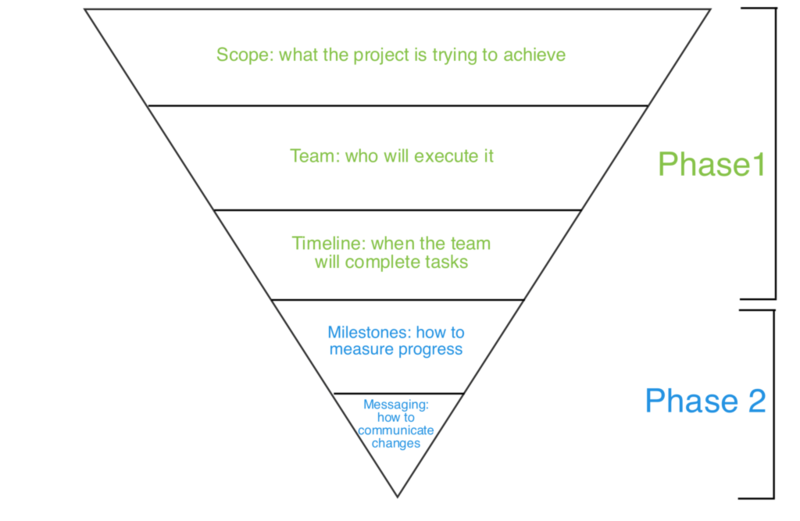 While due dates and project length are determined by the scope, the timeline shows how your team will divide and spend time for the duration of the project. A timeline points out when certain tasks must be accomplished and how those tasks are related. By laying out spans of time, you can predict and measure the speed of individual tasks, the efficiency of the overall workflow, and the effectiveness of communication. If the timeline isn’t executed properly, other planning will be worthless. An overdue project is often an over-budget project, and if a due date is determined externally (e.g., presentation to a client), mismanaged time could result in a loss of business. To create a timeline, simply assign time frames to your tasks. In Redbooth, when you create a task, you pull up a calendar to see what dates are available for the task. You can apply comparable time frames to similar tasks and even create subtasks with their own durations. Below, a timeline view of a project within a larger workspace. You can switch back and forth from the timeline view to the task-list view to learn not only which tasks have been accomplished but also whether the project is operating on schedule as a whole. Time tracking is a key duty of a project manager. 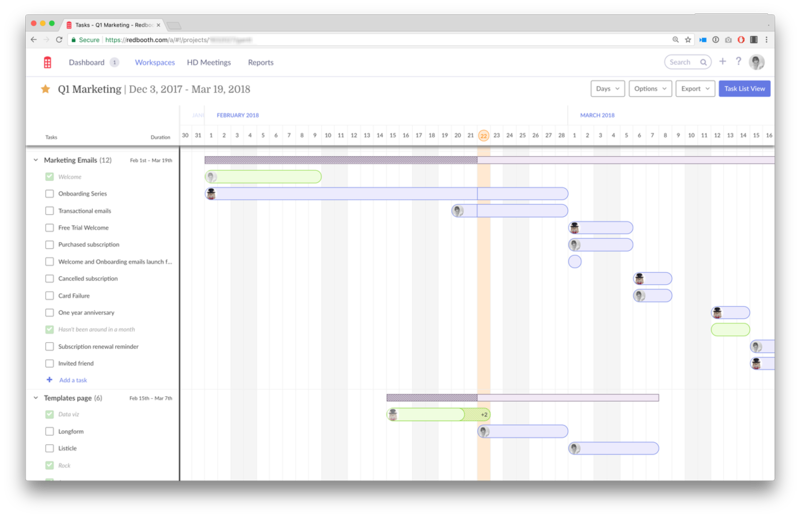 Organizing your project according to a timeline makes it easy to maintain oversight of a project’s progress. Once the project has been structured and organized, you can start to implement tactics that will help you work more smoothly as a team. Setting up milestones and communication channels will help drive productivity throughout the project. Milestones give team members something to look forward to; it’s a way for people to monitor their progress and measure incremental success. In the example below, a company is building a series of automated marketing emails. The milestone is the launch of the Welcome and Onboarding emails for new users. The Welcome email and the Onboarding email are separate tasks, of which the last is due on February 28th. The milestone task is set for the next day, March 1st, marking the accomplishment of the first phase of emails. In Redbooth, the launch is created as a task with a span of one day, and a special “milestone” tag is added. To see all milestones in one place, simply click the tag and view milestones as a list. Milestones are moments of celebration, but they are also built-in safety features for your project. With a highly visible milestone, the whole team can see the work that’s been completed, test the results, and make sure that the finalized tasks meet the standards for quality. Predetermined communication channels create clear paths for employees to check in with one another, post feedback, and ask and answer questions. When everyone on the project uses the same channels (such as Redbooth and Slack), you’re able to minimize uncertainty over how to get a question answered or how to let teammates know about important developments. The system frees people to think about the content of the message rather than the best way to package and deliver it. When there are a limited number of channels, efficiency is improved, making it easy to find messages and respond quickly. The more you can use contextual communication within your project management tool, the better. The most efficient way to discuss a task is when you have the work in front of you. As the project manager, you can enable notifications that will allow you to learn about updates instantly and address issues in situ. Contextual communication also allows for maximum transparency within a project. When team members can see conversations about tasks, they can see what’s going well and what should be avoided. 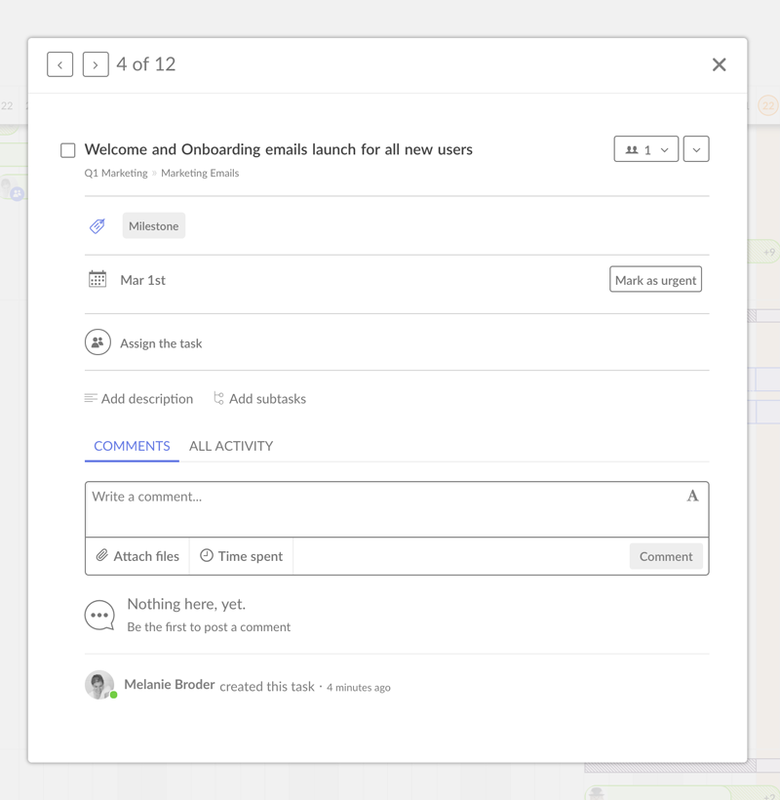 Task owners will be able to discuss things openly with you, and pass on what they’ve learned to teammates. When communication is frequent and easy to access, the exchange of knowledge and ideas flows more freely. By completing the preplanning steps outlined above, you can hit the ground running on the project’s start date. This planning will not only provide peace of mind but also inspire confidence in your team members. With the content, structure, and tactics delineated, you can plan for the best possible outcomes while still making room for problem-solving, teamwork, and adaptive performance. If you’re ready to dive into your next project, why not get ahead? Start a project workspace today.